Following the publication of the Media Reform Coalition’s draft proposals on the future of the BBC, we have organised a public debate on “The Future of the BBC: Public Media in the Age of Google and Facebook” in Committee Room 9, Palace lf Westminster at 6.30pm on Tuesday 16 October. Free tickets are available here. We have also received some tremendous endorsements for the proposal which you can read below. What’s gone wrong with the BBC and how can fix it? Jeremy Corbyn has called for the BBC to be democratised. How would this work in practice, and what other changes are needed to safeguard public, democratic media in an age of Google and Facebook? This event launches radical reform proposals produced by a working group of the Media Reform Coalition. 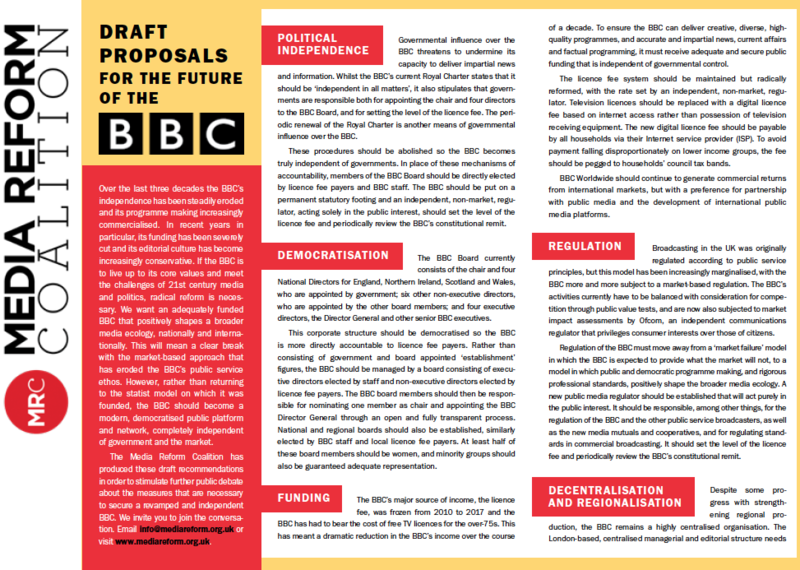 They advocate adequate funding and real political independence, but argue that rather returning to the top-down, statist model on which the BBC was founded, it should become a modern, democratised public platform and network, fully representative of its audiences and completely independent of government and the market. Join Clive Lewis MP, Tom Mills (sociologist and author), Zoe Williams (the Guardian) and Amelia Womack (deputy leader, Green Party) for a discussion on the future of one the world most influential media organisations.